I've been stuck for a few weeks now. I'm reading Preschooler by Anna Lefler and it's just dragging me down. It's not a bad book, but it feels like work. The weight of my TBR pile is weighing down on me. I remember when I was searching bookstores looking for something new to read. I sure don't have that problem, my Kindle is overflowing with great books. I'm gearing up for my annual girl's vacation the first week of December, so I'm looking forward to some beach reading time. Last year, I read Marisa de los Santos's The Precious One on the plane flying to Hawaii, and it was awesome. I thought that book would be much bigger. Plus I dragged the Liane Moriarty's giant hardback, Big Little Lies all the way to every Kauai beach there was. Happily, I foisted it on a friend once i finished it. Let her drag it home. This year - it will be all Kindle. behind the glossy façade, they’ve been desperately trying – and failing – to have a baby for years. Now, the stress and feelings of loss are taking their toll on their marriage. Claire’s ready to give up hope and get on with her life, but Ben is not. And then Ben’s best friend, Romily, offers to conceive via artificial insemination and carry the baby for them. most prestigious literary award: a novel about a perfectly reasonable woman's descent into the delusions of unrequited love Ester Nilsson is a sensible person in a sensible relationship. Until the day she is asked to give a lecture on famous artist Hugo Rask. The man himself is in the audience, intrigued and clearly delighted by her fascination with him. When the two meet afterward, she is spellbound. Ester's life is then intrinsically linked to this meeting and the chain of events that unfolds. She leaves her boyfriend and throws herself into an imaginary relationship with Hugo. She falls deeply in love, and he consumes her thoughts. Indeed, in her own mind she's sure that she and Hugo are a couple.Slowly and painfully Ester comes to realize that her perception of the relationship is different from his. 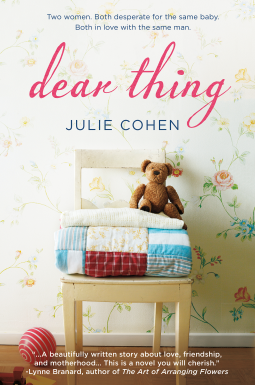 She's a woman who prides herself on having a rational and analytical mind, but in the face of her overpowering feelings for Hugo, she is too clever and too honest for her own good. 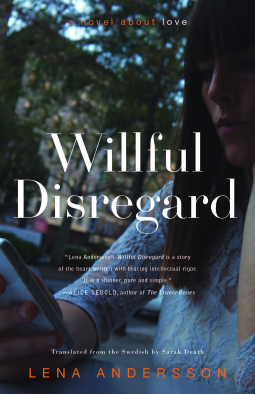 Bitingly funny and darkly fascinating, Willful Disregard is a story about total and desperate devotion, and how willingly we betray ourselves in the pursuit of love.